SHREWSBURY, JULY 3. There was big applause for Bob Crow when he threatened to walk out if Cameron came to TUC. Now invitation may be rescinded. LIKE someone slowly waking to realise there are robbers in the house, and this Con-Dem government is not just a bad dream, trade unionists are reacting with disbelief, then astonishment, and finally, indignation, to the news that the TUC General Council has invited Tory prime minister David Cameron to address this year's TUC conference in Manchester. 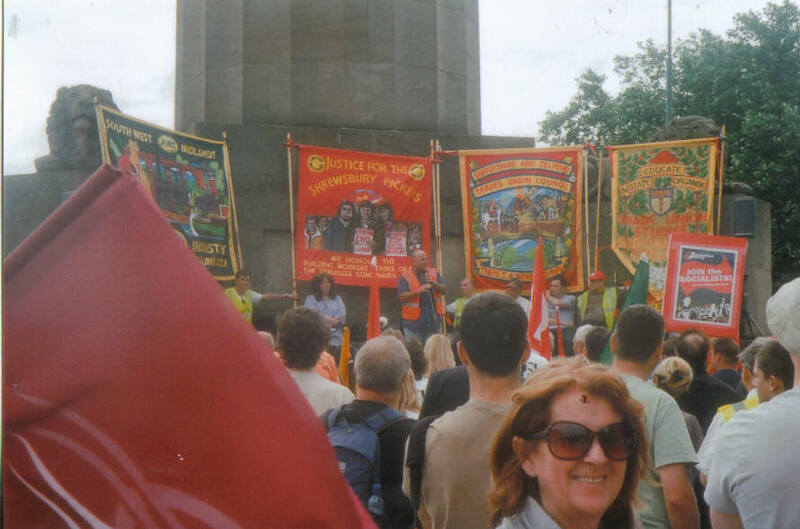 Rail, Maritime and Transport workers union (RMT) general secretary Bob Crow received stormy applause in Shrewsbury on July 3 when he pledged to lead a walk out if Cameron appeared. PCS president Janice Goodrich who was appearing alongside Bob Crow in support of the Justice for the Shrewsbury Pickets campaign, did not disagree. PCS assistant general secretary Hugh Lanning has reportedly agreed with the invitation, even as his members were protesting against the government's onslaught on services and jobs. Other union leaders appear divided over the invitation, which was announced to the general council by TUC general secretary Brendan Barber, without prior notice. Matt Wrack of the Fire Brigades Union and Tony Burke of Unite objected, but the invitation went through. Dave Prentis of Unison is reportedly opposed, his union saying it was not responsible because the general council meeting clashed with Unison conference. No fewer than four resolutions from affiliated bodies were submitted to the Southern and Eastern Region of the TUC (SERTUC) which met in London on Saturday. All four were ruled out of order for not having been submitted earlier, and not being emergencies. But at the suggestion from SERTUC president Martin Gould, who had condemned the invitation to Cameron in his opening address, delegates voted almost unanimously that secretary Megan Dobney should write to the TUC conveying the sentiments of the resolutions. allowed to address Congress 2010." "This Central Committee supports the motion overwhelmingly passed at the meeting of the South West Region TUC on 3rd July, which calls upon the TUC General Council to rescind its recent decision to invite David Cameron to this year's TUC Congress. We resolve to write to the CWU President and General Secretary, calling upon the CWU National Executive Council to rescind any endorsement of the decision of the CWU TUC General Council representative(s) to support the decision to invite David Cameron. If the NEC hasn't yet discussed this subject, then we ask that the decision of the TUC General Council representative(s) be NOT endorsed.Further, that the CWU writes to the TUC General Secretary, asking that the General Council decision be re-considered as a matter of urgency." This CWU revolt is significant because it was reported that the CWU's Billy Hayes was one of those union leaders who voted for inviting Cameron along. Post workers renewing the fight against Royal Mail privatisation plainly don't think providing a platform Cameron is part of that. And as in the Brent resolution, which was partly drafted by a CWU delegate, they are adding that the same applies to Cameron's Liberal Democrat deputy dawg, Nick Clegg.